Opposition campaigner, ex-deputy prime minister Boris Nemtsov was killed in central Moscow in 2015. Russia's Investigative Committee head Alexander Bastrykin considers the murder of opposition politician Boris Nemtsov killed in Moscow last year solved. "In 2015 the Boris Nemtsov murder was solved, as well as the murder of Coca Cola industrial enterprise director Dmitry Soshnev, the murders of motorists committed by the [GTA] band; we exposed the gang led by Inesssa Tarverdieva that used to operate in the territory of the Rostov region and Stavropol Krai and was involved in the murder of policeman Dmitry Chudakov, his spouse and two small children on the Federal motorway 'Don'," Bastrykin said in an interview due to be published in the weekly Rossiyskaya Gazeta: Nedelya on Jan. 21. 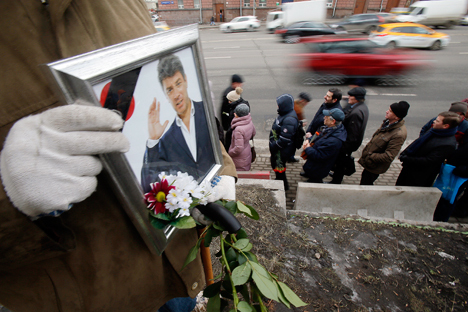 Opposition activist Boris Nemtsov was shot dead on Moscow's Bolshoy Moskvoretsky Bridge on February 27, 2015. A criminal investigation was launched into the murder under Russian Criminal Code Articles 105 ('Murder') and 222 ('Illegal Turnover of Weapons'). The investigation is being conducted by the Russian Investigative Committee's main investigating department. The period of the pretrial investigation has been extended until February 28, 2016. Investigators presented the indictment in its final version back in December, presenting charges against Zaur Dadayev, Khamzat Bakhayev, Shadid Gubashev and Temirlan Eskerkhanov, the four defendants in the case. The criminal case instituted against another accomplice - Beslan Shavanov - was closed in November 2015 on non-rehabilitating grounds, due to the death of the suspect as a result of detonation of the explosives he owned when police attempted to arrest him in Grozny, Russian Investigative Committee spokesman Vladimir Markin said. "It is planned to severely further investigate the case of Ruslan Mukhudinov, the person who ordered and masterminded the crimes and who has been on the international wanted list since November 2015, as well as the cases against some unidentified persons," Markin said. Investigators plan to complete the investigation into the main criminal case in January 2016 and submit all collected evidence to the victims and their agents and afterwards, to the defendants and their lawyers, for reading, Markin said. Meanwhile, Vadim Prokhorov, lawyer for the Nemtsov family, has repeatedly said that he does not consider the case closed. The lawyer believes that Ruslan Mukhudinov, the member of the Sever battalion of the Chechen Interior Ministry, who has been named as the organizer and paymaster of the assassination, could not act as such. "Yes, [he could be] an organizer at a lower end. But paymasters are high-ranking people," he told Interfax on December 29. Prokhorov filed a complaint with the European Court of Human Rights over an ineffective investigation last summer.